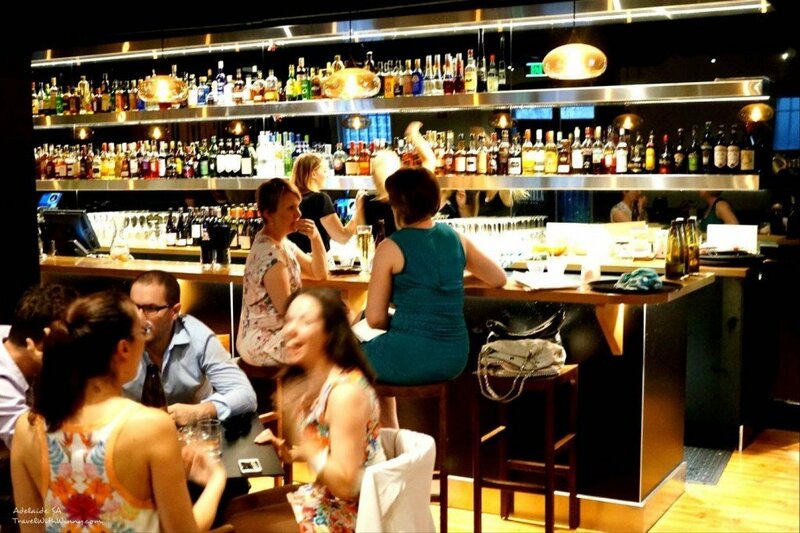 We had a great time at La Rambla Tapas bar. The service was good; the food was as close to traditional Spanish Tapas as we can get in Adelaide. Out of all the Tapas place I have tried in Adelaide this was the best. Definitely would be back again and definitely would recommend this place. For dinner tonight we visited a new Tapas bar on Peel Street which is between Hindley Street and Currie Street. I was quite surprised how many new bars and restaurants are popping up in little streets like these in Adelaide. The place looks like a typical bar but the place was full of young professionals. The two guys was seated on the table next to us were dressed fully hipster but they were talking like educated professionals. Although we were almost twenty minutes late, the still reserved our table for two and they appeared to be extremely busy with every table occupied. The appeared to have an upstairs area but it was closed off. Considering they were only open for two weeks, they were doing extremely well for business. We were placed on a table right on the side of the bar. It was a tight squeeze and the tables were close together. Directly behind my seat was row of seating that faces the wall. The place was rowdy, full of energy and people having a good time after work. 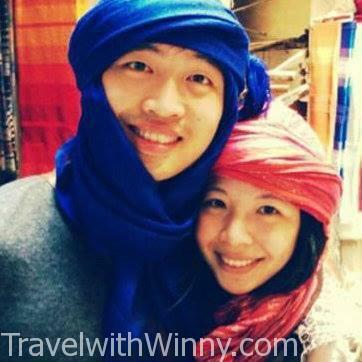 It’s a good place for a catch up with friends but no a date. The service was quite good. There were two waiter/waitresses making their rounds regularly. We were served quite quickly as soon as we wanted attention. Considering it was very busy, I think they did a wonderful job. The place pretty much only do tapas which is fine for a “Tapas bar”. 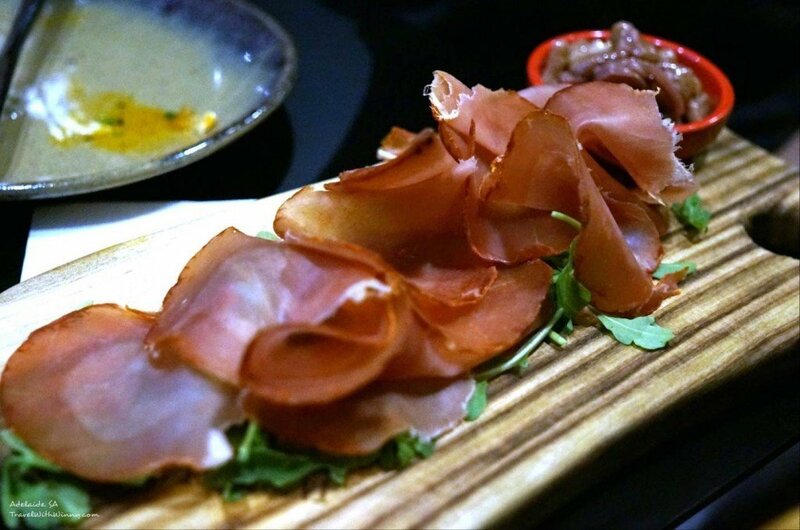 The Selection goes from: a section of cured meats and cheese section, Tapas on bread to normal Tapas. All of these looks extremely delicious and we were struggling to order just enough for two of us. 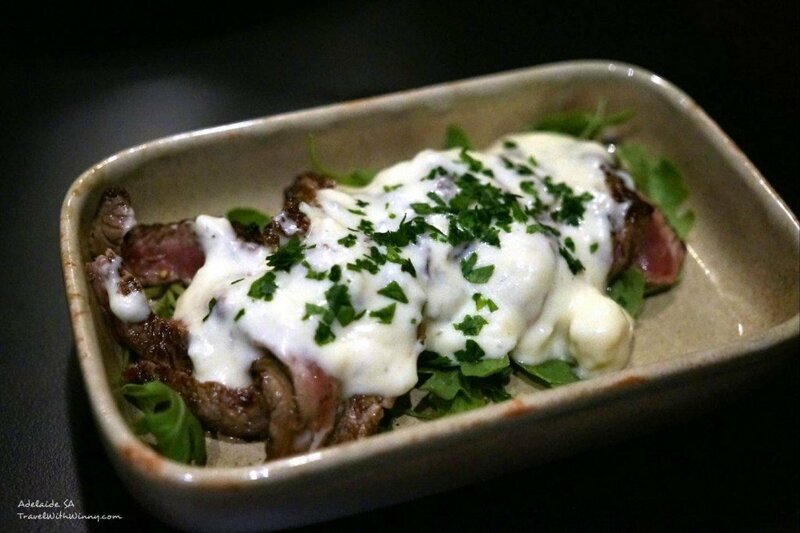 We started our meal with a meat dish called “Filete de Vaca” – Grilled Angas steak served with blue cheese sauce. It was a beautiful dish. The Angas steak was done beautifully the blue cheese sauce was not pungent and worked well with the meat. It was a great start to out tapas journey. 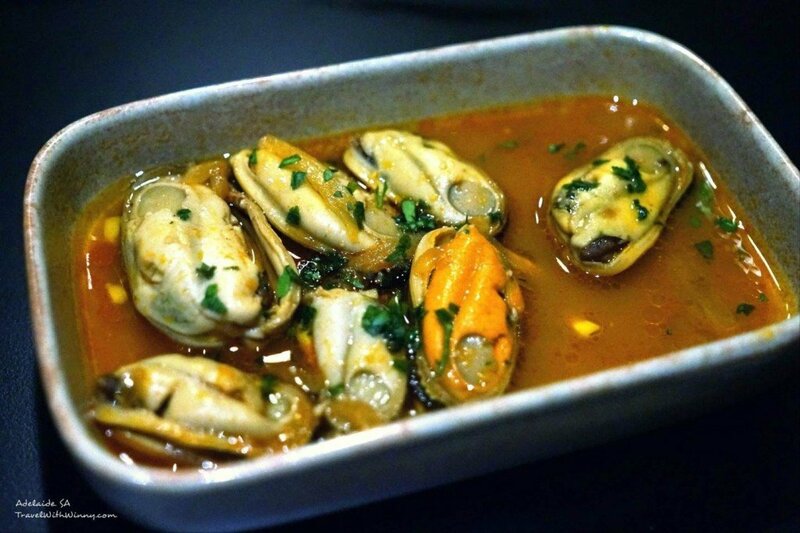 The next dish we had was “Mejillones en Escabeche”- Mussels cooked in sweet citrus-piquant parika sauce. The mussels tasted nice but it was a little too sweet. The sweetness basically covered most of the other taste. If I closed my eyes and ate this I would probably think I’m eating dessert. 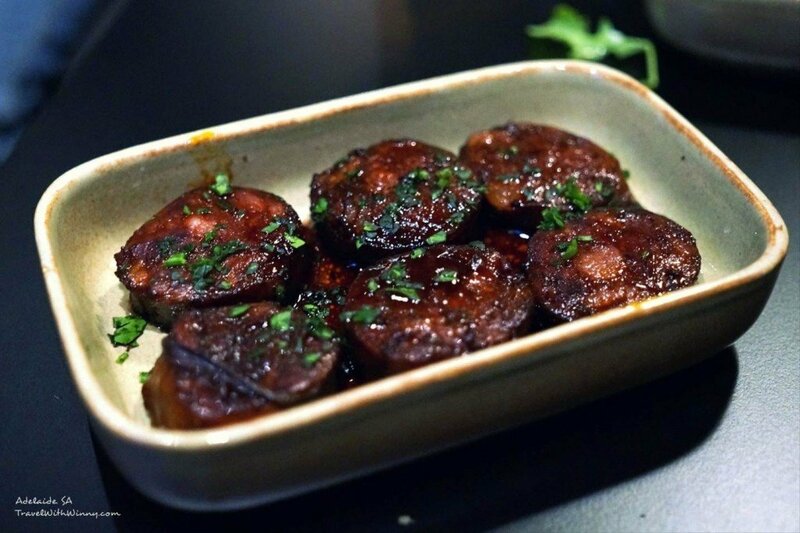 We then Had “Chorizo en Vino”- Chorizo marinated and cooked in red wine. Winny doesn’t like this dish because she doesn’t like things too strong in taste hence I don’t think she would like any chorizo on its own. I thought this dish was done well. Although strong flavouring, taking small bites allows me to enjoy the taste and the red wine does work well with it. It is more of a dish to eat slowly and enjoy it with some sangria. 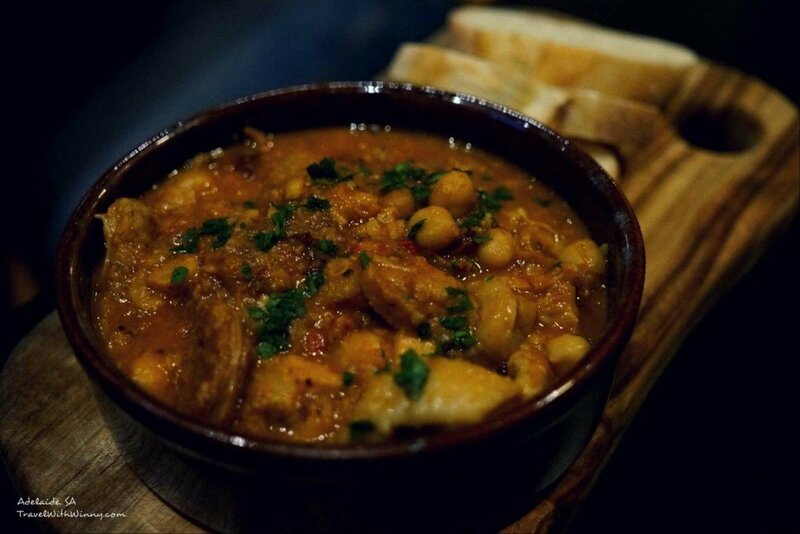 Next one we had was “Callos a la madriena”- Ox Tripe and chickpea stew, cooked for hours with black sausage. This was strong in flavour with a tomato base too but it was delicious. The flavour was cooked well into the Ox Tripe and it was tender. There was bread to go with this dish to soak up the sauce on the bottom. 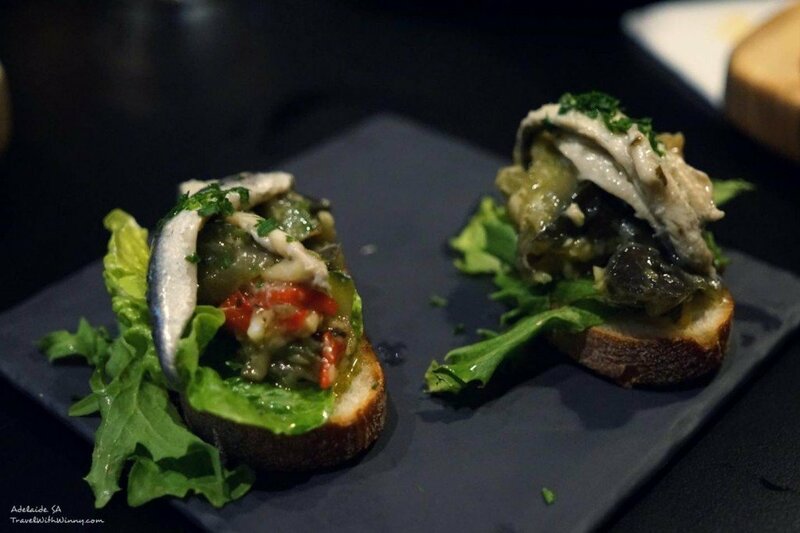 We also had “Escalivada con Boquerones”- Grilled vegetables topped with marinated white bait. This was typical Spanish Tapas. The fish and grilled vegetables mainly egg plants which were a bit soft and the white bait on top was drizzled with a bit of olive oil. We thought we would try some cured meat and we selected something neither of us has tried before “Lomo”- Dry cured pork tenderloin. The cured tenderloin still has the meaty smoky taste but the texture was a lot smoother. Never had a chance to come across something like this before and was quite impressed.